Back in the 60’s and 70’s, the Ace Cafe in London was THE place for motorcycling enthusiasts to hang out. In fact, legend has it that the Ace constituted the origin of the term “cafe racer” (not necessarily racers at all, but stripped down bikes to “race” from cafe to cafe). This was the heyday of the great British bikes.. Triumph, Norton, BSA, etc. Of course, the big goal of period riders was to “do the ton” (100 mph), and manufacturers were competing to produce bikes that could do just that. 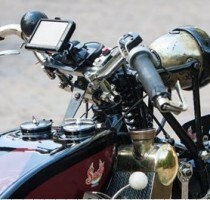 It is not an ordinary sight to see a guy regularly riding a 1927 motorcycle. But then, Mark Scott is not your ordinary motorcyclist! 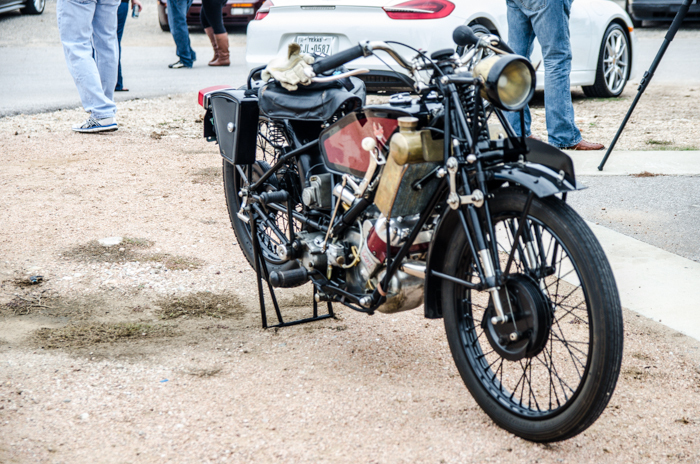 Yes, Mark, a resident of Volente, Texas, regularly rides his 1927 Scott “Flying Squirrel” motorcycle. Mark acquired his Scott bike, a British marque, in 2001, and has subsequently restored it to beautiful condition. Mark is certainly not a one-bike guy.